It has become a necessity in today’s world that your business should have an online extension to it. On an average calculation, 60 percent of the whole business is online and when it comes to car rental companies then it might go up to around 90 percent. We are all aware of this that all the medium and small type of business these days have apps or website. It is one of the needs in the today’s world that your business should have an app, especially if it is car rental service. The need of having everything on fingertips or we can say , luxury has become a necessity for the people. People are taking cars on rent for vacations, events. Car rental mobile app development has taken a rapid growth in the industry. ZoomCar, the company was established in 2013 just with the 7 cars and the numbers have now expanded to 1800 cars. The car rental service requires a reliable solution in terms of a car rental mobile app. There certain features which should be there in a car rental app for boosting their business. The on-demand car rental app should provide multiple choices for hire as there are different people who require cars for different occasion and keeps distinct taste. So, it should be designed in such a way that there are different car categories available to the user. The car rental app should have the online booking option so the user can book their ride just with a few clicks and it must support a reliable payment gateway. 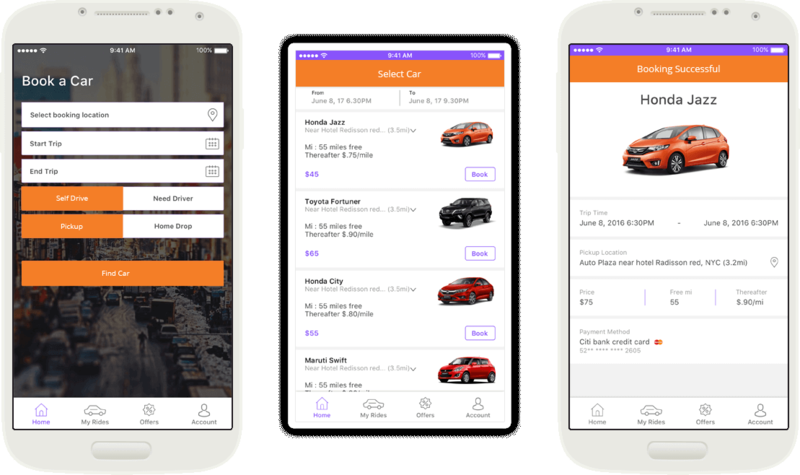 It is a necessary feature for a car rental app that it can book instantaneously and should provide all the details of car like number colour and other attributes. It is sort of an extension to the above feature; it lets you manage your past booking even may be to shift dates or cancel it. If you have to cancel or reconsider the date; such options must be provided. It is one of the basic and essential features of a car rental app so it can provide you if not the exact amount then at least a very close estimate to the actual fare. The fare calculator should be designed in such a way that it takes KM or miles as a basic unit. However, you can also account for the time for which the car is rented. But, be sure you provide a better deal as there is competition these days in every market. Recommended Read : How much does it cost to build a marketplace website? It is a must thing that you provide receipts to the consumers it doesn’t matter if those receipts are online and not hard copies. But there must be something to provide customer satisfaction. The app should have notification and alert feature which should remind user before the delivery of the rented car or in case of failure to deliver the car. The car rental app has real time location tracking and GPS enabled in their rental cars so that customers are aware of their arrival before time. Location tracking and sharing option must be there or you can just take the support of Google maps or Bing maps. It would be beneficial for the business if the customer can choose the car pickup and delivery points as it adds to their ease. There are a lot of people who don’t want to go an extra mile to deliver the car and this would really help you. You can however add cost to the far delivery and pick up points in this way people who are luxuries would also be on your side. Promo codes & offers are something which is best for business encouragement and helps you attract more customers. Most of the car rental software or apps these days have these promotional offers to boost their earnings. You will get attention if your promotional offers are good and providing occasional Promo codes helps you to grow. When people want to book a driver along with the car. This happens when people goes for a long route journey. In case of driver unavailability, they would have another option. You can also allow users to choose driver on the preference of age, gender,experience. Admin can manage all the vehicle details and update the details. Admin store clientele and other information about the client such as which cars he had rented and what’s his usage. Storing these types of data might help you to know the needs of your customer better and add some more features to your app via update. All the car categories are managed by admin and all the car information is updated accordingly. All the fares, renting cost of individual areas of cars are managed by admin. All the real time details, car renting details, categories, time scheduled are shown in the form of graph. While developing car rental mobile app, it is imperative to choose the right technology. An mobile app delivering high performance and quality reserve a seat in a competitive market. Location tracking : Google Maps for android and Apple Maps for iOS for user tracking. Real time analytics : Google analytics can be used for real time tracking, traffic. Database : MySQL, Hbase etc can be used for storing the data. SMS and Phone verification : The developer can use Facebook login and google sign in for that. After the finalisation of the features, It's time to move forward to the development process. The process of development is step by step. Most of the mobile app development companies charge on per hour basis. For a car rental app, with the above-mentioned features and a team with developers having 2-3 years of experience, the average costing per hour would be around $30 per hour. The estimated hours for such app with proper testing and feedback takes around 200 hours. The costing of the developer will also vary with the location, experience and the kind of technology the app would be needing. So, if you are looking to get a car rental app that is effective and falls in your budget then contact Logicspice. Our proficient team of experts has years of experience in developing competitive apps that are easy to use and creates an impressive image for the client.